Today the TE Design Team is sharing their sneaks of a new set called Sweet Occasions concepted by Jami Sibley. I was lucky enough to be involved illustrating this unique addition to the Whimsical Wishes line of stamp sets. Get ready to colour!!! Jami wanted four large images with fun and inspiring words--call this the outie--paired with an innie, additional sentiments with mini images for that special touch on the inside of the card. 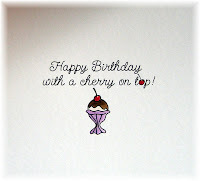 I've chosen 'Celebrate' and matched it with 'Happy Birthday with a cherry on top!' and the mini ice cream sundae included in the 14-image set. I used a previous TE sketch (TECC59) to get the juices flowing. I need more colourful cards for the kids occasions in my stash, so this one is perfect. Henri probably talked me into buying this fruit-infused, patterned paper--it's quite a departure from my usual style! I pulled green, purple, pink and black from the paper for my colour scheme and coloured the image with copics to coordinate. Thanks for dropping by on your way today! Soooo cute, Nancy! What a fun color combination! I don't usually gravitate toward purple, but I love it here! Super cute, Nancy!! I love the swirly circle and all the texture you created on this card. Not to mention the fabulous bowl of ice cream!! Yum!! Nancy this is fantastic I love the ice cream & sentiment! The colors on this are my fave so far! Thanks so much for sharing. 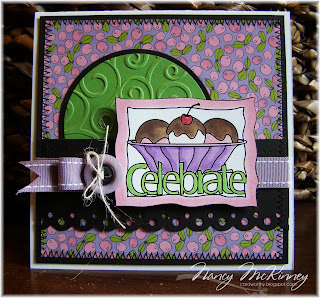 love the embossing and colors, nancy! 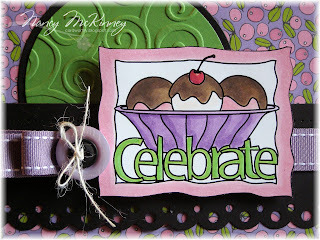 love the way you added the cuttlebug embossing to the circle and the stamp set looks cute to. Just beautiful, Nancy! What a fun all-occasion set! This is just awesome, and that bowl of ice cream looks so yummy. I can tell that this is such a cute set. Fun card! Super cute, love the button & ribbon! This is so cute, Nancy! I love the colors... where'd you get that DP? Great card, and I love the purple and green (my girls' favorite colors!). love your card and color combinations. I just love this set. Love the sentiment inside the card. Great card--I like the inside messages to go with the front. I LOOOOOVE this Nancy! The colors and papers ROCK and the layout is AMAZING too!! what a fabulous card, I love that pattern paper Henri probably had you pick out! so glad you played along with us again! I love your card! It's fabulous! Very pretty! Love the purple! Wow, I totally love the colors! You ROCK! Nancy, you rocked this sneak peek! I love this set! LOVE this Nancy! The colours really pop and the inside is as pretty as the outside!!! Nancy - I don't know how I missed this last week! Love these fun colors and I always love a bit of black as well. Thanks for making my vision REAL - you ROCK! Beautiful work! This is the first visit to your blog. It won't be the last!